Imposter Morgan is not acting like Real Morgan and though Tara realizes that something is wrong, she is just chalking it up to his drinking and perhaps the stresses of court. Part of the reason Tara cannot discern that Morgan is not who he says he is, is due to the fact that her childhood sweetheart Graemore has come back into her life and to say that it is a little distracting is putting it lightly indeed. So instead of dealing with her problems, she whiles the day away with Graemore, of whom we learn his origin and the backstory behind their romance. 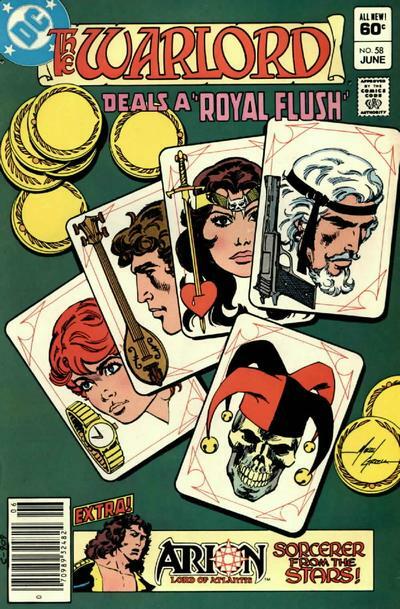 It was really nice to see Mike Grell give Tara a solo tale, though there was really little to it other than what was described above. It would have been better to see her accomplish something or have her own quest to solve of some sort, but this was fine all the same. The drama is running high in Shamballah and the question remains, how is it that Tara has not noticed that Morgan is an imposter? He acts nothing like the man and while she might be a little distracted, she should be more on the ball than she is. Graemore on the other hand is hoping for something he can never have, yet come the end of the issue it seems like that something might just happen, at least for the moment that is. This was actually a very pleasant issue, much different than what we are used to seeing in this title and it shows that Mike Grell can do something other than the mystery of the week type of episode, or story to be more on point. With an Arion, Lord of Atlantis backup as well, this book was really quite good.